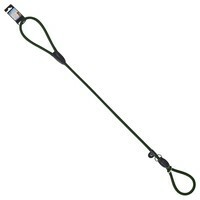 Company of Animals 3 in 1 Slip Lead is an all in one dog training solution. The lead can be used as a head collar or slip lead to prevent pulling, or as a fixed collar and lead for general exercise. Made from the finest polyamide, the lead is extremely durable and weather resistant, and has a stainless steel stop ring and a loop for holding.